The third Bachelor Pad episode began with the typical reflection period. Then Melissa quickly did a downward spiral, and I am perplexed about this situation. I believe Blake needs to stop playing with her heart, because this situation continuously gets worse. If you honestly have to mess with a girl this bad to win, your game plan is tragic. The next morning started out with a synchronized swimming challenge. I enjoyed how much the men loved this challenge. Michael was determined to win and his choreographing was outstanding. The men were more ambitious, since some of the women participated in cheerleading. Unfortunately, that was not the case. The women went through the motions. 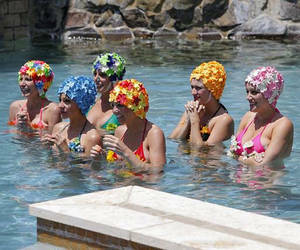 I thought they all looked adorable with their flower swimsuits. I loved Michelle in this challenge, she appeared to have the most fun. Michelle did not expect to be the best, which made her being great, much more comical. I was glad to see Natalie and Dave return to the show. They both exude a carefree attitude. Last season included a plethora of laid back contestants, compared to this season. Natalie’s style is phenomenal, and her dress was perfection. All of the judges tallied their votes, and the votes were finalized. Michael and Michelle were the winners of the synchronized swimming challenge. Graham: There is no question on why Michelle chose Graham. They are both beautiful for one, and would be fabulous together. Their kissing was magical. Kasey: Michelle invited Kasey, because he is a member of their alliance. He also needed a break from the drama in the house. Blake: Michelle being the wonderful voice of reason helped Blake out. She knew he was on the chopping block, and whether that was justifiable, she made him aware. This date overall was gratifying to watch. I feel that this date represents how last season's cast behaved. It was apparent Graham was receiving the rose. Kasey and Blake appeared to be content with having a relaxing night. Holly: It is clear why he chose Holly. Vienna: She is entertaining! Michael most likely took her on a date, because Kasey had been on dates. Ella: She seems so sweet, and would be a fantastic non dramatic date option. Vienna was the most aggravated horse riding participant ever. Everyone else was having a joyous time, and that speaks volumes, with an ex couple on a date. Michael and Holly had another heartbreaking conversation. During this grueling conversation, Ella and Vienna were conversing elsewhere. Michael offered Holly the rose, and the date progressed. 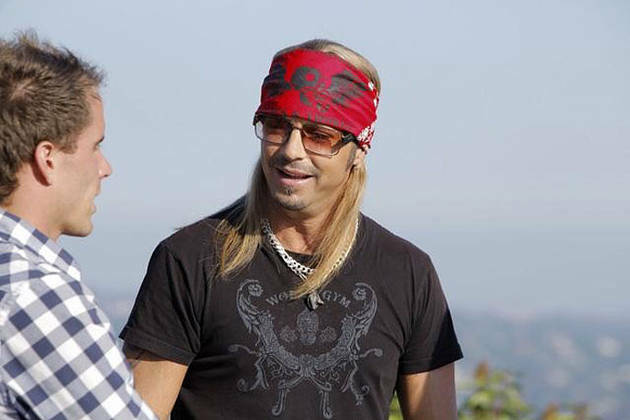 As if this date was not awkward enough, Bret Michaels appeared. Michael was elated to see Bret Michaels. Holly was ecstatic that Bret Michaels thought she was beautiful. I hope they are not casting for Rock of Love season fifty! Joke! Bret Michaels found out there was an engagement. He congratulated them, without waiting for the entire story. Michael and Holly told him they broke up. Ouch! To Holly and Michael’s defense, Bret Michaels is the last person I would take relationship advice from, besides Charlie Sheen. Bret Michaels performed Every Rose Has Its Thorn, and I witnessed television gold in front of my eyes. The rest of the episode included Kasey and Vienna fighting. When Kasey asked Vienna, "Do you want another public break up on television?" That was extremely melodramatic, and I am thankful the world did not end. There was also an alliance formed between Erica and Jake. They kissed and it was a peculiar moment. Erica was a spy during the episode, and was very sneaky, sign her up for the CIA. I loved her fashionable gavel. Erica is hysterical, and makes marvellous television. There was some more fighting. Blake returned to Melissa’s good side, and an uncomfortable conversation between Jake and Kasey occurred. Michelle was responsible for handing out roses. The final two were Kasey and Jake. It was the closest vote in Bachelor Pad history, and Kasey’s name was called. Then the show blacked out, like the vast majority of contestants. The show ended with a Jeff and mask montage. I am certain Jeff and the mask should be incorporated in every episode. Brilliant!! What were your thoughts on last night’s episode? The Jeff Mask Montage's are brilliant! I love them, they make me laugh so much! Other than that, I don't want to get too in to it but I just can't stand Kasey or Vienna. Vienna I hate the most. She's an ugly person. Yuck.